Two interesting mistakes here. The first has to do with the Pythagorean Theorem, the other (more interesting) has to do with the angle of inclination. I wonder what she’s looking at that the angle always stays the same. My guess, based on her first triangle, is that she thinks that the diagonal of a rectangle always bisects the right angle. This might make for a nice bit of feedback for her. I could ask, “Is it possible to draw a rectangle whose diagonals don’t always make 45 degree angles? 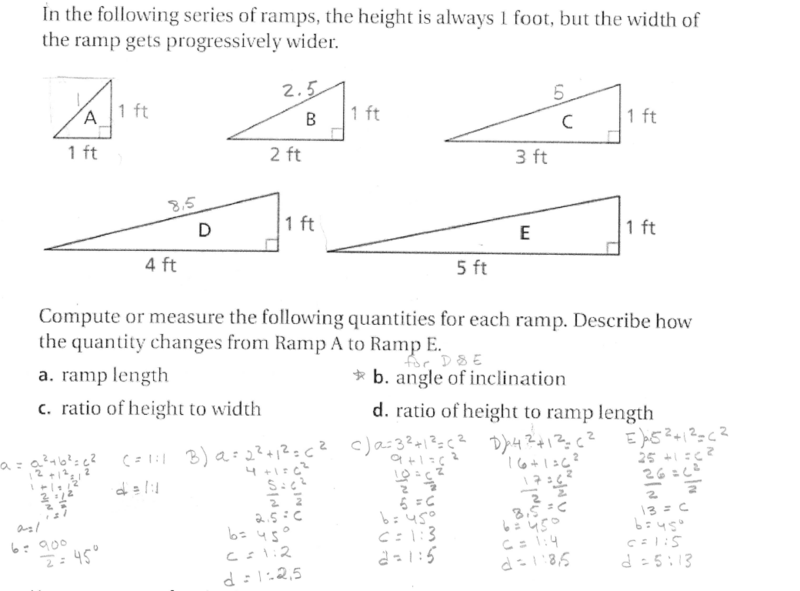 The answer matters for what you wrote here.” Or maybe the feedback I supply here should be a counterexample — a very long rectangle whose diagonals clearly don’t make 45 degrees? What’s my goal in this feedback, anyway? I suppose my only goal is to have her know that the diagonals don’t bisect the angles, and to believe this in a way that she’ll remember and be able to reproduce on a new problem. So I want to equip her with the means to prove it to herself. One last worry. What if I’m wrong about my diagnosis of her thinking? What if she is seeing 45 degrees in these ramps in some other way? Maybe the best thing is to check in with her verbally before giving her any written feedback, to confirm that my theory is correct? 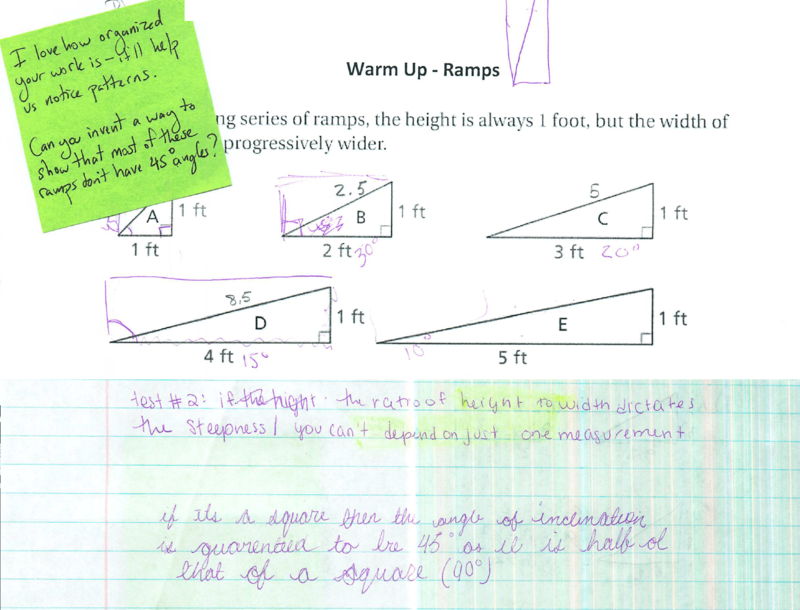 Update (4/23/15): Here’s the feedback and her post-feedback work. In conversation, I was able to confirm that my “every rectangle’s diagonals bisect a right angle” theory was right. Posted in Geometric Measurement and Dimension, Pythagorean Theorem, Right Triangles, Similarity, Right Triangles and Trigonometry. "All the sides in the 6, 8, 10 triangle are equal." "They are not similar because you have to add different numbers..."
Decimal Misconceptions? Meet similar triangles.